1966 Mr. America & Sports Performance Pioneer Bob Gajda Discusses Bodybuilding Experiences (Part 2)! [ Q ] Legend has it that Mob Bosses comprised some of your cliental back at the Duncan YMCA. They would even come in to train wired up. Tell me more. and those guys - famous guys from the movies. And they used to play handball down there (at the Duncan Y). I just knew them initially as members that were there all the time. I was with the Young Men's Organization and that was the executive club. But I read the tribune one day and there was a whole exposure and all these guys that I knew were there. There was one incident that I recall, that was terrifying. I was opening up the place and I had a guy - a friend of mine I had hired to run the swimming pool - and he didn't show up; he was in traffic. So I had a line up of young kids who were waiting to go swimming. So I opened the doors and turned the showers on for them. I told them to take the showers and wait. Then I ran up the hallway to call this guy to make sure he came in. Well he was on his way and coming down the stairs. At the time I went back into the shower room and a guy was taking pictures of these kids. I said, "What are you doing, who are you?" And he said, "Who are you?" I told him I was the boss. I asked him what he was doing with the camera. He said, "I am taking pictures." I asked who told him to take pictures or if he had authorization to do it? He said, "no I don't have authorization, I just want to take pictures." Just then, my assistant came in and I said, "Hold this guy here, I'm going to call the cops." So as I was going to call the cops and the guy went to hit the phone. He hit the phone. At the same time, my buddy, who was in there, took the camera and broke it. Threw it on the floor purposely. What happened then was this guy, my buddy (a member of the Chicago Mob), said, "We are going to take care of it." So they took him outside, broke his fingers and threw him on top of a truck that was going to Iowa. Honest to God. The police saw it and concluded it was just deserts for a creep. That was the way it was handled. That was the truth; Duncan Y was a Mafia bastion. They protected it. When we held fundraisers, it was the Mob who helped. It was, "Here is the money, boom." We had seven YMCA's at the time; we were the wealthiest YMCA in the world. Among America's ten most wanted, (Momo) Salvatore Giancana was head of the Chicago Cosa Nostra (Mafia) and heir to Al Capone's empire. On June 19, 1975, at age 67, Momo was whacked (killed) with six bullets to the head - one to kill him and five just to be sure. There were fears at the time that he would break Omerta and testify against the Chicago Mob. In his spare time he would play a mean round of racket ball at the Duncan YMCA. [ Q ] What were the Mobsters like to deal with? Well, they loved handball. And it was a neighborhood place where these guys grew up. And there were guys who essentially grew up in the Taylor Street neighborhood. The Duncan Y was just a few blocks North of a very Italian neighborhood. And those guys went to the Y because that was their Y. But they stayed there even after they became Mobster notables. One day someone showed me the newspaper and said, "Do you know these guys?" And I never put two and two together. They always looked very good and liked the fact we were helping the kids. And when we had fundraisers they were, like I say, always very complementary. And now you have the Sopranos and the Gambinos, but there was some value to the guys from my gym because fundraising was real easy. [ Q ] The Mafia was simply like any other group of gym members? I never saw a racial fight in all the time I was there; we were all mixed. And there was a community. They (the Mafia) were very nice people. They used to play cutthroat handball. They would have three guys in there and one of them would be really good. They would come down and play these games in the handball court - all excellent handball players by the way. [ Q ] Was there much betting and gambling going on when these guys played their games? The reason we (the YMCA) were there was because we were funded by the big department stores and we had to keep the kids off the streets to keep them from stealing cars, because this would impact shopping. The first year I was involved there was a 14 percent decrease in car theft. Then it went to 17 percent. The kids would develop spirit that is gained when they feel they belong to something. See at that time we had the black Muslims looking for pride; we had the black pride. Nowadays we can all be proud; we have a black guy who is going to be President (Obama). He is intelligent, smart and good example for the rest of us. [ Q ] How times have changed. American's going though it. We are going through a big catharsis as a nation. We have words that you can use and can't use. There are people coming with a particular syntax; "I said this and that." And we have everybody analyzing it from psychotherapists. And then the guy has to say, "Well I didn't mean it that way, I meant it this way." But it's a good time because people are starting to think clearly in America and we are not so easily propagandized like we once were. [ Q ] Do you have any more interesting Mob stories to share? Well they would help in the context of taking care of the neighborhood. And there was an agreement between the Mafia and the police to protect the people in the neighborhood. There was much more negotiation and communication on that basis and some level of respect. The history of the Mafia is that they killed their own, not others. And they protected the neighborhood. That's what gives you the idea of soldiers and all of that. Where some other groups, they prey on each other. The turf of Grand avenue and all along there still has a lot of Italian remnants. [ Q ] What were the exact circumstances surrounding your removal from the Duncan Y? Well the quote directed at me from a preacher at the time was, "We have to get rid of the honky hernia factory (the Duncan Y) and take care of our neighborhood kids." But they meant well. They were looking for political position. But my gym was integrated. I had black kids, Hispanic; everybody was mixed. That was good. I wanted homogeneity; that's what we were after with the YMCA. But the YMCA got taken over with this other thing (the Black Congressional Caucus). And the Duncan Y happened to be the wealthiest Y in Chicago. It was a missionary thing we were trying to do with heart and soul. It's the triangle of the YMCA: spirit, mind and body. And that's what we did: we kept kids out of trouble. I still think that's the best way to develop character. The kids who can lift weights will gain more confidence. It's a beautiful thing. Now when it got taken over by the (Congressional) Black Caucus they moved in and a lot of weird happenings occurred and then somehow they (The Mob) got back in their for a while. See, they threw me out because I was a honky; it was reverse discrimination. Second of all, I went and got a teaching job the next day without any problems but the whole program died. They had prisoner release and they turned the handball courts into Project Head Start. And they bankrupted 28 million dollars in one year. Figure that one out. I'm not afraid to say it; I gave all of my devotion, but there were all of these other things happening. It was racial, it was definitely discrimination reversed. But God bless them all because those were the times. [ Q ] What was your mission with the YMCA? and fat kids in America. What is with these kids and these games and radiation on their eyeballs and all that stuff? Those of us who are interested in health need to take a second look at all this. What is it that Rene Dubos said? "The ingredients of utopia become the agents of new disease and disorder manifested in our time." Twentieth Century French-American microbiologist, experimental pathologist, environmentalist and humanist Rene Dubos (died: 1982) devoted most of his professional life to the empirical study of microbial diseases and to the analysis of the environmental and social factors that affect the welfare of humans. [ Q ] How difficult was it for you to walk away from the Y after having invested so much of you life there? At the time I had friends who were principals of schools who were begging me to come in. See I was certified in different things. With the YMCA I was a certified secretary. And the YMCA went through a lot of different changes in terms of its direction. We have YMCA's now that are big profit centers; they are not for profit in name only. In actuality there are YMCA's that are putting other clubs out of business. So that is a competitive business with a 30 percent benefit. Do you want to go into business with me and I will give you 30 percent? But that's what is happening. The park districts rightfully so but the other districts aren't taking care of poor kids. My thing was about taking care of the poor kids and giving them ideals. I have kids now who are doctors and one kid is a dentist and so on. And they are good examples for other kids who still come from the inner city. You have these others guys who are making millions of dollars but they aren't helping the inner cities. [ Q ] Did all seven YMCA's go under? There are actually two left: Camp Duncan was a part that is still existing. It is a campsite that is outside of Chicago. And Duncan Medical Center is still in existence. But out of seven that is all. [ Q ] You alluded to the muscle scene in Chicago having died out somewhat. What is the muscle scene like in Chicago today?
. But the effects of creatine are even questionable in terms of even working. But in any event, they assume that since their kid is putting on muscle they are taking steroids. The kids are living this life as if they are doing it - why do they have to take all this punishment? It reminds me of the old days when I used to have to go and promise before the Holy Mother that I wouldn't lift weights. Nowadays they are getting labeled as being steroid users. They were against it (weight training) then, and they are still against it. It is like you have a great thing that is dying because you have stupid running it. [ Q ] What are your views on the bodybuilding physiques of today versus those of your era? Somebody said recently, and I had to shake my head: "It seems they all look the same." Because the steroids are the equalizer they (the competitors) all look the same and they have these funny looking muscles. They look like puffs, like cream puffs around the muscles. And the thing that is most overwhelming is the female bodybuilders. I said this to my buddy John Balik and he said the women who take the steroids have twice the effects as the guys. Over the years I have seen guys that all they ever got from steroids was nosebleeds. When the women take it, my God. It is beyond what Bev Francis achieved. - are doing the same exercises they did in my time. Not a single different exercise. There is nothing new. But how does everybody have great legs now? It was the denominator. You had guys with great torsos. You could name them. They had torsos, but lacked legs. Now everybody has got legs. How the h#ll do you do that? How do they develop their sartorius and they don't even know how to develop it? Then there is that guy who blew up his arms, shooting that synthol into his muscle. And the muscle doesn't even look like muscle. It looks like a loaf of wet bread. "It looks like a loaf of wet bread" - Bob Gajda on synthol use. The rationale in sports for taking steroids is to heal. These people are purposely, knowingly using steroids to shred their body and kill themselves with their training. It's beyond the pain nowadays. It is almost self-destruction followed by the body healing. But what is healing on the body is scar tissue and scar tissue is not the same. [ Q ] Let's discuss the PHA system in more detail. What does it achieve and what are its applications? I cited my mentors. You start with William Harvey on the PHA (Peripheral Heart Action), and then went to Arthur Steinhaus. I was a student of Steinhaus so used PHA, but took the principal - a law in physiology or basic fact - that without PHA (training) there would be no venal return. But secondarily to that you have lymphatic return. When the guys are pumping themselves up they are congested with fluid; it's not just venal blood, it's fluid. So that's what delays the process of return, so my idea was to get it moving by moving something else and to use your collateral circulatory pumping action - PHA. So it becomes a concept; we are going from a rule to applying it to muscle recovery. So my idea is to work the muscle again but do it lighter. That's the idea, lighter pumping which makes for the healing instead of relying on drugs. It's a factor in the body that you utilize. There was a time when people stayed in bed for days. Nowadays right after an operation they are moving. Why are they moving? That's PHA: circulation, heal. So with the bodybuilders or the strength lifters you have to facilitate that recovery so you don't get into the need to heal. [ Q ] You speak of the congestion of fluids as they relate to weight training and the pump. What fluids are we dealing with specifically? You have to take lymphatic fluid, synovial fluid (which lubricates and protects the joints); you can look at all the fluids of your body. Say your body is roughly 80 percent fluid: so that is a combination of plasma, that's interstitial tissue fluid. All of those fluids are generalized under interstitial fluids so when you say interstitial tissue fluids, a part of it is arterial blood with oxygen, another part is venal blood that's running the waste back or getting rid of the Co2 (carbon dioxide, a waste product contained in the blood and eliminated via venous return). So that's the transport that's going on. And then you have lymphatic fluid, which is lubricating the muscle fibers; that's why we warm up. You warm up gradually and get more fibers working and then you strength train and work all of the fibers. So that's the idea; you try to overload it (the muscle system) but with all of these different kinds of rest periods. Because you are not sitting down and talking after each set of heavy benches, but doing other, lighter, exercises. [ Q ] To enhance circulation. Right! To get it out of the area, not letting it in. It is the opposite of Weider. Weider used to congest. Sometimes people will read my paper (on PHA) and get the message about working the opposite action. Here's the point of it: if you are, for example, trying to work your elbow flexors - say your biceps and brachialis - real heavy, you want to work the triceps, not to pump it but to reset the fibers, which are getting too contractile. The force is making them shorter. So you go immediately to the opposite. Not supersets. Supersets would be when you do biceps/triceps, biceps/triceps and so on, or flexion/extension, flexion/extension. But that's the pump. The idea here is to use the other one to reset it then go around to other muscles to make that muscle reset. so you can come back stronger. I proved that in my own research and reported that in my paper. We were doing 70-pound preacher curls and we just kept going up. We didn't go down. The guys with the 40-pounders are pumping and they're done - only 40-pounds. Looking at the tonnage, they're not there. There has got to be the correlation of the strength. The big wrap on the current guys is that they are not strong. They are big but they're not strong. And you have this thing too: guys don't lift overhead much any more. It's bench dominated so you have protracted shoulder girdles going on from the time when guys were lifting overhead. They would stay off the bench presses because they didn't want to get big pecs. Nowadays you have bench presses and no more overheads, which kind of balances the body. And now the new guys are lacking the value of the old: strong and healthy looking. [ Q ] You don't hear too much about the PHA system these days. Do you think people might be confused about the PHA philosophy given so much of today's training methods center around pumping as much blood as possible into the muscle? The idea is to understand it in the syntax, the context and philosophy of what you are trying to accomplish. The idea is train, don't strain. Now the idea is strain, strain, and strain. It doesn't even make sense. So when you are looking at a few guys that can tolerate that and afford the drugs and the supplements that go into maintaining that scar tissue, now you have to consider if you are going to do it natural you have to do it within the physiological parameters that your body allows. It makes sense. Another thing that makes perfect sense is the information contained in Randy Roache's new book Muscle Smoke and Mirrors. I am considering running a course at the college near where I am and calling it Bodybuilding and using Randy's book as a textbook - because it gives you all the beliefs too. , and the physiques reflected that. So in the early stages you had a different kind of a body. [ Q ] So you would emphasize targeting another body part after training a larger grouping? ; so what do you want to do? Do something light for the ankles or light for the wrist: something to keep the fluid going, not exacting more in the area; pumping it out. Lymphatic fluid is totally dependant upon Peripheral Heart Action; those little muscular pumps. If you are standing all day, your legs swell up. So what do you do? You decongest the legs. In modern bodybuilding they want to congest. To my way of thinking, you want to decongest. You don't want to inflame, you don't want to swell an area. The classical sign of inflammation is feeling the heat. Bodybuilders call it the burn. You feel the heat swelling up and it's time to stop. That's your measurement: when it burns, stop. Go and do something else, then come back and do it again. Don't just keep pounding it, but go lighter and lighter to get the fluid out. That's the key. And the results come with it. That is the best way to lose fat and do it all. Like Perry Rader said: it's the best way to do it all. [ Q ] Would one application of this be to do a cool down at the end of the workout? , the best sleep is active sleep. You don't want to pool otherwise your blood gets stagnant. It needs a little pumping action through rolling in bed back and forth. That's the refreshing physiological thing that people get confused about, about getting enough REM sleep and all of that - about certain states of consciousness and unconsciousness. You can get that and still be restless. When you are told to lie still and not move, that's not invigorating sleep. You wake up tired if you haven't moved. The idea is that movement is life and that's the philosophical point of PHA training: the life force is about using, not overwhelming. [ Q ] Thank you for expanding on the PHA system. On another note, these days you have personal trainers making many dollars using concepts that were developed by yourself and those who came before you. Oh yeah, well you have got examples of that. You have got this guy Pilates. I went to his gym way back when he was in New York and one of my teachers from Columbia brought me over there. She was involved in dancing. And he trained a lot of dancers. He had the surgical tubes hanging from the pipes; it was one of those old kinds of tenement gyms they had there. So he used surgical tubing way back when they started doing that. But the rubber bands: I think I am an original on that, putting them around your ankles and stuff. I have a patent on a device you place your feet in it and it holds your legs steady while you work your ankles. It is like a mandatory functional training device. [ Q ] What exactly is this device used for? Injury rehab?
. Whoever overdeveloped their ankles? Give me one guy? (Laughs). Who ever overdeveloped their pecs or their biceps? You can always think of people who have done this. And when you are talking about the lower extremities you don't just have calves. You have got those deep muscles that control your spring, that absorb shock. We have had so many guys doing plyometrics over the years. Now that's an interesting history. I was there when those guys were injuring themselves with plyometrics. Now it is accepted once a week but you have to have good coaches teaching the right techniques. [ Q ] When did the plyometrics phenomenon begin? You had the influence when the American weightlifters that were so enchanted with the Russians and the Russians were doing this plyometric training like dropping off a six-foot platform and then rebounding into squats. And they were doing this with their volleyball teams, their weightlifters. It was their form of functional training. So Americans started doing this but they started too high - they started at the fifth level and the fourth level. If you are jumping off then you are coming down with triple bodyweight. Those guys couldn't hold bodyweight so that's when I went onto one-legged squats where you are working more control, working for a soft down jump. With my jump box the idea wasn't so much to jump high but to learn how to jump down from it. And that's what they didn't know when they started doing plyometrics. And now they are doing plyometrics, but the coaches don't know what they are doing. And what's this nonsense now. They let the guy land heavily - boom! But that is wrong. You have to have a soft kitten-like touch when you land, that's the difference. That is what's missing right now. [ Q ] So with box jumps, you would emphasize more the landing or downward phase as opposed to the rebounding aspect? Absolutely. That is the eccentric phase. You know, Arthur Jones came out with the negative training and this is the most interesting thing we have now in the news. They are talking about when you are doing eccentric training you tear the muscle down and then that is what makes it sore, its eccentric. So concentric does not make you sore. Who in the h#ll starts these stories, honest to God? I have been in this business thinking about it, doing it and seeing it and I wonder how they come up with these goofy ideas. I don't know. Eccentrics make you sore. And tearing your body down, they use hyperplasia as the end of the story. That's absurd as it is connective tissue. Bodybuilders are hurting themselves producing scar tissue in their muscles. This is the craziest thing. And you read this stuff and everything in there is about healing; you probably need to take a pound of aspirin in your protein shake now (laughs). And they can only do it once a week and they do 65 sets for one part (laughs). You know what has got me thinking, because I have had so many requests for my PHA program now. I think it is more in the fitness area. They want to know about bodybuilding but they don't want to go crazy and freaky like the bodybuilders seem to be going: sensible and safe, and not crazy. You know, when Nautilus came out I was always amused at how they did it. I mean you have to go to failure. And by doing that they got everyone so d@mn sore the first time they didn't want to come back. And that would lay a guilt trip; it would show how much out of shape you were because you did too much, instead of progressing gradually. It was always an interesting thing to watch in the industry. You get in and get out was a good idea but it got to be a bodybuilding thing where you had the guys using the steroids and it's all they would do: one set and they did it to failure and they took the steroids. A lot of people couldn't do that. On steroids you can work out with a yo-yo and you will get results. 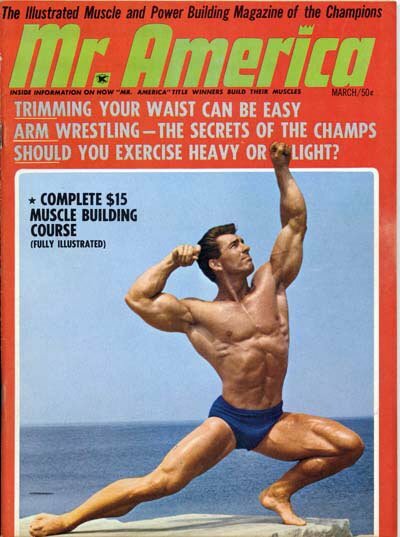 Bob Hoffman was talking to me about Vern Weaver (1963 AAU Mr. America) one time and he said: "You know I can't believe a guy can lose his muscle in two weeks." And that would be it; these guys would blow out from this hydraulic pump, and after they went off it, after two weeks they would drain out again. It is an absolute science these days. Archimedes and hydraulics is what we need to think of. As I read these modern bodybuilding books - I read them out of interest every now and then - it is just fascinating where they come up with these ideas. "On steroids you can work out with a yo-yo and you will get results." - Bob Gadja on modern bodybuilding pharmaceuticals. I think the steroids and drugs have made it to where it is in a blur right now. Somebody said that Mars was in retrograde into Neptune, which makes things appear blurry. [ Q ] Some of your ideas are not widely promulgated but they do make sense. you put the DARD on your foot and you work your ankles like I spoke of before. In a fitness program it is to my mind important to work every part and it should be done within an hour. A sensible workout: no strain, just sensible. Here's the thing: the guys work their calves but they don't work their tibialis or shin muscles, or some of the deeper muscles in the foot. So I have a whole system of exercises like the DARD that could fit into any fitness program because nobody, at least in athletics, has ever overdeveloped their feet and ankles. And that is an athlete's prize. [ Q ] How exactly would a bodybuilder use the PHA system? - generally what you would call callisthenics type exercises - from all different positions and all the kinds of stuff you would do in the gym. And he was explaining the choreography for this was based on the PHA system principal. So as we discussed this I started applying it to bodybuilding. But you can also use it for other things: for example, Danish gymnastics is a viable fitness system. But each culture has their so-called systems. We don't do much these days in terms of callisthenics; they call it aerobics and stuff like that. I Started Applying It To Bodybuilding. There are some good things that go with it that are missing now, that go with functional training. There are some things that were bad about it, like toe touching - whether it was slow toe touching or rapid toe touching, just don't do toe touching and put the rest of it back in: that was my idea. Even at the championship level when you use the PHA (Peripheral Heart Action). There is this guy Tim Larkin, who has a team that trains all those Navy Seals and Delta Squads, and they are using the PHA. If you set up your equipment properly you can move guys through faster like the way Nautilus wanted to do. But you have to be mindful that you don't want to congest one body part. You want to help it recover and that is the idea and the beauty of the PHA; you want to assist the body to recover. How do you do that? When you lay down, for example, work you lower rectus abdominis while your legs are draining; that helps with the drain. All this idea of the movement as a secondary heart action is the whole key to it. And they get into the flow of it and the guys love it. They are seeing how many chins they can do instead of doing a set and resting, doing a set and so on. They go to light exercises as supplements to help recover from the big exercises. [ Q ] So these days you would still combine callisthenics with weight movements? Yes there is a safe, sane way to do callisthenics. My system is predicated on doing one-leg standing movements so that whole kinetic chain develops to the maximum. [ Q ] And developing the kinetic chain is an important part of your system? I've worked a lot with hockey guys over the years, especially the Black Hawks. Guys are able to do things that were once killing them such as running. You have swimmers that go out and run and kill themselves; their joints are getting damaged. They don't have the kinds of bodies that are adapted to all the pounding. You have to develop that ability to handle all those different forces. [ Q ] How would you develop the ability to subject your body to all that ongoing pounding? (Magazine) who said it gives you the best of all worlds including a good body - as distinct from the callisthenic type body, which stays the same. The value of using the weights for body sculpting gives you a good body plus the value of strength. We come from generations where they used to throw batons to one another - that was exercise. Well this kind of mentality is coming back. You see it everywhere: with kettle bells and all of these extreme pieces of equipment. [ Q ] Would you agree that working in an unstable environment, such as with a Swiss ball, is a good way to develop core strength and the kinetic chain? Yes that is the idea; same as when I use the cushions and the sponges. You see these products out there these days that you blow up and stand on. All of those are excellent novelties and that is the idea: keep the brain in the learning mode. And that is the difficulty you have with the treadmills and bike, where there is often boredom. You have to put a TV in front of people to get them to do it. And there is only a certain type that can do it. Then there are other people who are adventurers and learners; I think the sportsman needs to be adaptable. [ Q ] Do you feel that machines are not as effective as free weights, as it is thought they fix you into one angle of resistance? That is true, but that is why you come back to your own body - controlling your own body. Machines are great for certain things - to do triple drop sets and if you want to move the weight pin quickly and so on. I haven't seen a real bad one like the Nautilus pullover; that was killer. I saw two people dislocate their shoulders right in front of me. They marked it wrong because the forehead is the end of where your elbows go; they don't go any further, then you start dislocating things. Guys into weightlifting specialize in learning how to do this but for the general public you can't. [ Q ] These days a lot of people train with little thought regarding how a particular exercise is stimulating the target muscle. How important is it to know your body and to have a good grounding in sports kinesiology when aiming to build your body through weights? whole thing was concentration: feel the up, feel the down and feel that static. The whole idea is that the sensibility of the muscle is being developed; call it the awareness of the muscle. You want the brain to feel the muscle; that is the key. It is all about muscle control. I could get my muscles to do different patterns and what I would do differently is to control the muscle. So that was a missing dimension in the whole perception of physical therapy. It was said they kept physical therapy behind 75 years; the idea of contractility is the one that has come of age. The contraction - concentric, eccentric and static - those are the modes. When you have the stability factor: that is static. Holding the body into an erect posture is what Sherrington called the tonic mechanism; having the control. So all of those are in performance training and that is what I look for. I do more head adjustment than anything else in terms of helping people. [ Q ] Just how important is the eccentric part of a weight training movement? portion of the movement demonstrates that the force of your body going down is four times greater than it is going up. Example: you weigh 150 pounds and are walking upstairs and each leg is getting 150 pounds; going down that same leg is absorbing two to three times of the 150. That is when injuries tend to happen in the eccentric phase; you get things like contusions. The neurons can't fire correctly so you could be running and all of a sudden the leg just goes boom, and gives out on you. [ Q ] So eccentric can be more harmful? Well originally it was the unmentioned part of contractility and now it is an important part and has been recognized as such. The point of it is it has to be coached. All of these things need to be coached. A good personal trainer should be watching these things and has to know safety factors. Because you are at the extreme, being at the extreme of anything the joint is being taken way too far. Like in the pull it is often just too much. When I originally wrote the book Total Body Training with doctor Dominguez it was for safety, for the industry - because at the time aerobic dance classes didn't have any physiology or anything like that behind them. [ Q ] In your book you talk a lot about head stability and how it impacts performance. Just how important is head stability in dictating athletic performs?
." You don't know how to do it the first time. There has to be somebody to show you how to use correct form. That is what the Russians mentioned in their plyometric research: that form was a key factor, that you have to teach this before you go jumping six feet down (as in a plyometric depth jump). Or even with rebounding: if you can hear it loud then it is compressive. It will stress everything from the vertebrae to the knee joints to the ankle, feet and all of that. They are going to get severe pressure. So you have to train the body to be able to handle that. [ Q ] Do you have any examples of how to correctly coach form? team they were 25th in the world. I would go down there for six to eight weeks at a time and work with them. We did all the jump boxes and all of that. Anyway, when it was all said and done these guys, besides winning two Olympics in volleyball, were the best jumpers at the Olympic village. They would do these tests where you jump sideways, forwards and backwards, over and broad jumps and so on. They tested all of the different sports on these and the volleyball team won and there was not a single black guy on the team. In America they say white men can't jump. Well I say, look at these guys, we have white guys that can jump (laughs). I don't mean any disrespect but they say that black guys are born with basketballs in their hands. I mean anybody can be good at basketball if they practice correctly and often enough. [ Q ] What in your view is wrong with the fitness industry today? I had seven quarterbacks last year with sprained wrists because they don't know how to do power cleans. We have all these personal trainers running around America thinking they know how to do it but they don't. They don't know the difference between a reverse curl and a clean. And we have to get the old guys back just to teach these kids how to lift weights because they are all hurting themselves.
. I mean power cleans for girls? You can prescribe this but you have to show how to do it properly. And you have all these guys on steroids. They have gotten rid of Olympic lifting. Every time you hear about lifting it's not that a guy made a world record, it's that someone was on steroids. So the stigma is there. So you have to come back and say that with strength training, you can still do it without drugs. But does anybody think we can learn to lift weights right and safely? [ Q ] What changes have you seen in the fitness world since you began? It's like what my friend Terry Strand said: "We have all the onuses". We have the problems with vanity and the "don't do this because you will become musclebound" mentality. And Randy Roach underscores them beautifully in his book. But now it's the guys in the gym, the older guys who can get medical stuff to enhance their training. I look at it with the same attitude I had in the '60s. I decided not to take steroids. I used to say I got them free in the steak I was eating. And that's the reason I didn't eat chicken because it supposedly had estrogen. [ Q ] Thanks you very much for your time Bob. Great insights. It was all my pleasure David.